Information below is obsolete for the current product versions bundled with Java 8. It applies only to the old product versions that depend on system JDK installed on Mac. As of now, we have resolved most of Java 8 issues for this OS and bundle our custom patched Java version that works the best. In case you have any issues with Java 8, you can switch back to Apple Java 1.6 (must be installed per instructions below). See this blog post for the instructions. JDK 1.6 is required to run and may be missing on your system. Please install Apple JDK 1.6. There should be a window with the suggestion to install Java when you start the product for the first time, but it could be hidden by other application windows. Apple JDK 1.6 download: http://support.apple.com/kb/DL1572?viewlocale=en_US&locale=en_US (if this link doesn't open in Safari, please try Firefox or Chrome). Make sure to uninstall the old version first (if you have any). Modifying Info.plist will break the application digital signature and prevent the patch updates. We do not recommend modifying Info.plist file to run under JDK 1.7 or 1.8. The recommended way of overriding JDK version via idea.properties file can be found here. Issues marked as [fixed] above are fixed only in the custom JDK 1.8 builds provided by JetBrains and bundled with some versions of the products (mostly EAP builds at the moment). We plan to bundle it with all the products eventually. tried Vermicida's fix and it seems to have worked. Serge, any updates on this? It's been an issue for over a year and using an outdated, insecure, unpatched JVM is not a long term solution. Please address this issue and create a launcher for all of your products that will use any installed JVM. Gshankman, we decided to use JDK 1.6 by default for now, until the issues mentioned in this document are resolved. Apple still updates this JDK, 1.6.0_65 version was released not too long ago. As this JDK provides the best experience with our products, it will be used by default. As soon as JDK 1.8 critical issues are resolved, we'll switch to the new version. Oracle has unveiled a plan to end support for Java 7. Ted - Your link is an old list of bugs that affect IntelliJ. This is a very mixed list. Some of these have been fixed, some are in progress (such as the subpixel aliasing one), others are due to quirks in the Apple JDK that was not part of the Java specification (keyboard shortcuts) that IntelliJ must work around, etc. Putting the blame on Oracle for all of these is incorrect and hardly fair, especially given that the JDK for OS X is a free/gratis product. We work off our bug backlog in priority order, and since this is OpenJDK the discussion on the issues and the fixes as well as the priority calls are openly available. And of course, if you urgently need something fixed, join OpenJDK and contribute, or persuade IntelliJ to do so. Cheers! We don't blame Oracle in any way. Indeed, some bugs are already fixed in Java 9. For other bugs our developers are working together with Oracle to speed up a fix or provide a workaround. We are contributing patches to OpenJDK, etc. 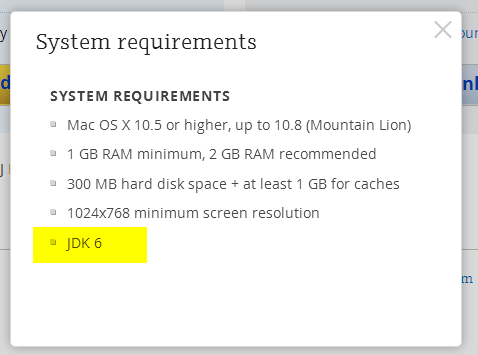 It doesn't change the fact that at the moment Java 6 provides the best experience with our products on OS X. As soon as we feel that Java 8 can be used without major problems, we'll switch to it. As of now, java 6 does *not* provide the best experience. I was finally forced to update, and had to hack WebStorm to run on java 8. So far I have not had a single problem except that WebStorm was so out of date. gp, I'm not seeing any font issues. Can you tell me where you are seeing them? I'm interested in seeing if I can reproduce your issue. Side-by-side comparison. 1.6* vs 1.8* using OSX 1.6 vs Oracle 1.8. GP: do you get that if you switch back to the default scheme (Preferences -> Colors & Fonts)? I'm sort of seeing a little blurriness around the edges, but I had to look so closely that I didn't notice until then. The blurring in the first picture is harsher than it actually is on screen. I just had a revelation: it appears to be a monitor calibration issue? On my MBPro Screen, the fonts actually look fine. On my external, an LG 22", fonts look un-aliased. GP, I'm not seeing the same issue, although I do see that the anti-aliasing is much heavier in WebStorm than in Eclipse. iI you "save as" you can edit the theme to try another font, but I suspect that not going to work, since it's the anti-alias thats causing the problem and they have not allowed you to change that property. Anyway, i've attached an example so you can see what I see. The image is pretty much exactly what I'm seeing on my screen. Not sure if it makes any difference, but I'm running a late 2011 MacbookPro with Yosemite and a Thunderbolt display. Ahh, that is interesting! Could it be a resolution issue? I mean, it still shouldn't happen, but maybe thats why it looks ok to me. My only guess is Apple may have fixed something within the JVM to resolve font rendering issues on external monitors with third party applications? I do know I don't see this font issue with other OSX apps. Just PhpStorm (which also happens to be the only java app I use). I don't like that Apple pulls herself with a blanket and gives users a leaky Java 6 with most of the vulnerabilities that it is not possible to fix without changing major release. In JDK9 and the latest build of Java 8 added flags for deduplication resource consumption and the new garbage collector that reduces impact and resource consumption of the IDE. In Java6 Apple still felt the problem with the race threads and memory lock and regression problems IPC in a multi-core CPU. Opening one project, all good! Opening a second project.... phpstorm crash! After upgrading to Yosemite, the OS re-installed Java (1.6.0_65) and things work mostly fine. Mostly, since I did get a Java crash (in ant, outside of JetBrains), so I filed a bug with Apple, and they responded that Java is no longer supported. They still install it for you-- and a newer version, even-- but it appears to crash more often and they don't support it. Long story short, JetBrains needs to update their Java version and OS X installation strategy fast, because that's about as big a hint as Apple gives that OS X 10.11 will make it really hard to run Java 6. And with Oracle discontinuing Java 7 at about the same time, we need a version that targets Java 8. Please return to the Apple Support homepage. Can someone please give me direct download link to 1.6 ? Bpappin, how did you hack in JDK 8? ...disregard, reinstalling JDK 1.6 worked. Just going to go with that until JetBrains updates the default version. I modified the Info.plist, by changing the 1.6* to 1.8* and it worked fine. The note at the top of this post says it will prevent updates, however I have had at least one successful update since I made the adjustment. I'm surprised after all this time this is STILL an issue. I'm going to have to switch out from using PyCharm unless this is fixed very soon. This could not have been a surprise as I'm sure JetBrains has access to beta version of Apple software. I'm not going to hack, modify or install an outdated, obsolete JDK in order to run the software. I changed the Info.plist to specify JDK 1.8* instead of 1.6* and it seems to work just fine. I agree with other posters, it's absurd to insist on a totally obsolete version of the JDK.